Welcome to Jeannette Douglas Designs, a counted thread needlework design company. If you love cross stitch, and beyond, this is the place for you! Take some time to browse all of the unique designs and enjoy. All of the patterns to complete your own stitched pieces are available at your local needlework shop (LNS). Many JDD patterns also have an embellishment package available, which includes those sometimes hard to find items needed to complete your stitching and give it that special touch. You'll also find on the site Jeannette's event itinerary. Listed there are opportunities to spend a lovely few days stitching with friends, as well as to meet with Jeannette. You're bound to learn something new, or just brush up on some stitching techniques. So, come, spend some time on the site, and learn about all the wonderful treasures you'll find at Jeannette Douglas Designs! Same great classes just a new name. 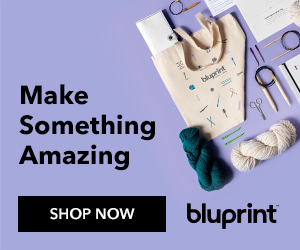 Enjoy all your favourite crafts on the Bluprint platform. In August 2015, I was so pleased and excited to announce that I had signed up to become an instructor on Craftsy! Click the photo on the left to my course page, or the 2 links below where you can view the trailer for the course, see the lesson plan, and sign up!